Albwardy Damen – a joint venture between Damen shipyards Group, based in Holland, and Albwardy Investment, Dubai – has added a fourth location to its ship repair business in the Middle East at Sohar Port and Freezone, Oman. The new facility, located between Muscat and Dubai, will complement existing facilities in Sharjah, Fujairah and Dubai. Sohar is Albwardy Damen’s first location in the Sultanate of Oman, and renders Albwardy Damen “the first ship repair company to have a presence in Oman’s rapidly growing logistics hub,” says sales and marketing director Willem Moelker. As with Albwardy Damen’s other locations, Sohar will offer ‘a full range of afloat, workshop, and diving services.’ These will include hull and deck steel repairs, engine overhaul, electrical works, pipework, and hydro-blasting and painting. Diving will be providing by Albwardy Damen Diving, headquartered in Fujairah, which will mobilise dive teams when required. Riding squads are also offered. 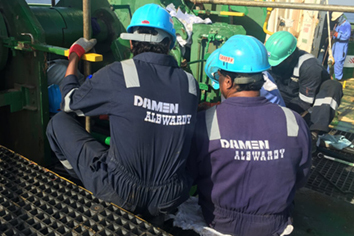 Albwardy Damen operates in both the marine and oil and gas markets providing repairs, maintenance and conversions, claiming over 150 drydockings per year. The company also has a small newbuild division constructing both Damen and non-Damen designs up to 120m. OEM representation includes Mitsubishi MET Turbochargers, Yanmar Marine Diesel Engines, and Kawasaki Thrusters.